Say G'Day Saturday Linky Party ~ Roast Pumpkin Soup Recipe! This week has been a bit crazy at our place. It was back to school week but poor old Big Al was sick so he had the first two days off. Maddy went back to school for those first two days and then went on a school camp. She comes home today and I can't wait to see her! We have all missed her so much! I started back at school this week too but luckily I haven't had many classes so I have had time to look after after my patient. I did find time to make some pumpkin soup for our #SundaySupper and, after a long, hot summer it was so comforting to sit down to a warming bowl of nurturing goodness! I made up the recipe as I went along and everyone in the family loved the final dish! I thought I might share the recipe with you at today's Say G'day Saturday Party! 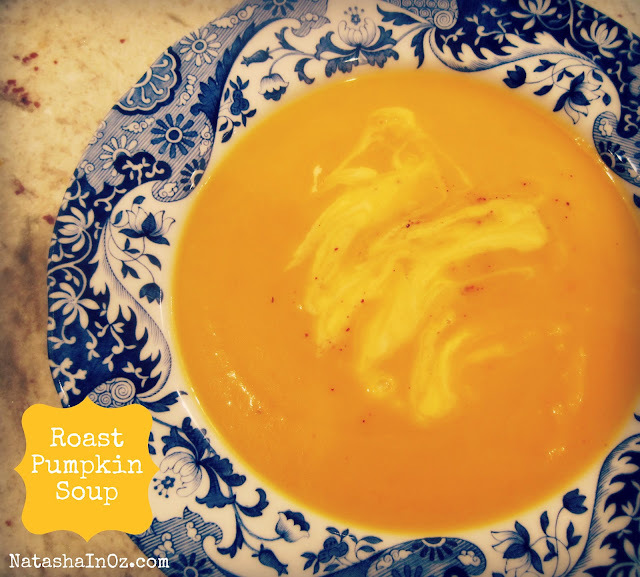 This roast pumpkin soup recipe uses a variety of pumpkins, some potatoes and some carrots. The carrots enhance the gorgeous orange colour and adds a delicious sweetness to the soup without taking over the pumpkin flavour. The other thing that adds a sweet and rich dimension to my soup is that I roast the vegetables first. The soup is taken to whole new level of yumminess with the addition of the sticky and caramelized pumpkin! Our family loved this soup so much I think it will have to become a regular addition to our Winter Sunday Suppers! Preheat oven to 220°C. Combine the pumpkin, rosemary and half the oil in a large roasting pan. Season with salt and pepper. Bake in preheated oven for 30 minutes or until tender. Do keep an eye on the pumpkin so it doesn't burn. Meanwhile, heat the remaining oil in a large saucepan over medium heat. Add the onion, garlic and ginger and cook, stirring until the onion softens. Remove the rosemary then add the pumpkin mixture and stock and bring to the boil. Reduce heat to low and simmer, covered, stirring occasionally, for 10 minutes or until it reduces slightly. Remove from heat. I used a hand blender and whizzed everything until it was smooth. Taste and season with extra salt and pepper if needed. Ladle soup among serving bowls, add a small sprinkle of nutmeg and drizzle with cream to serve. What is your favourite Sunday Supper Recipe? Do you have a twist on a traditional favourite? If so I would love to hear your ideas and suggestions! Perhaps you have blogged about your favourite comfort food? If so I would love it if you could link up your post to this week's Say G'Day Party! 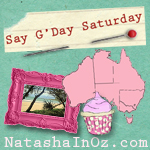 The Say G'day Saturday Linky Party is a weekly link up where you can share any posts that you are proud of! Let's see if we can make a difference by taking the time to Say G'day to as many bloggy friends as possible! Thank you so much for visiting me today in my little corner of the world Down Under! 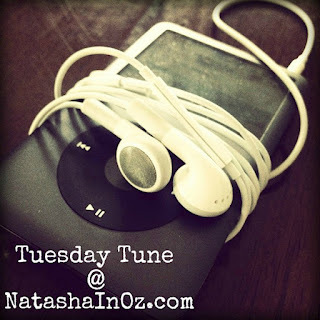 Please be sure to come back on Tuesday to hear my favourite song for the week at this week's #TuesdayTune Linky Party! Oh my that soup looks soooooooo delicious. I try to make soups or stews on Saturdays. I may be trying this tomorrow. Yummmmy. Thanks for hosting! I am all linked up. So funny thinking about you complaining about the long hot summer when we are just getting used to warmer days in the northern hemisphere. I'll file this delicious soup away for our autumn days. We enjoy pumpkin soup but not normally at this time of the year, how ever it was so cold today we did have soup for lunch! This pumpkin soup looks Yummy. I have never had pumpkin soup!! Thanks so muck for your sweet comments. Hope you and your family have a wonderful weekend. Natasha, pumpkin soup is a dish I make in the fall. It is delicious. Your's is very pretty served in the blue and white bowls. Love orange with blue! That soup looks so comforting and delicious! Thanks for hosting. This is the first time I have been on your blog and am your newest follower. Not sure of the round trip I took to get here, but will be back. I posted my bedsprings wreath and enjoyed the other posts! Hope your little guy is feeling better! We are leaving soup season, but this looks good! wish your son a soon recovery. The pumpkin soup looks great. Thank you for sharing the recipe and for hosting ths event. Your recipe sounds great, I will try it sometime. 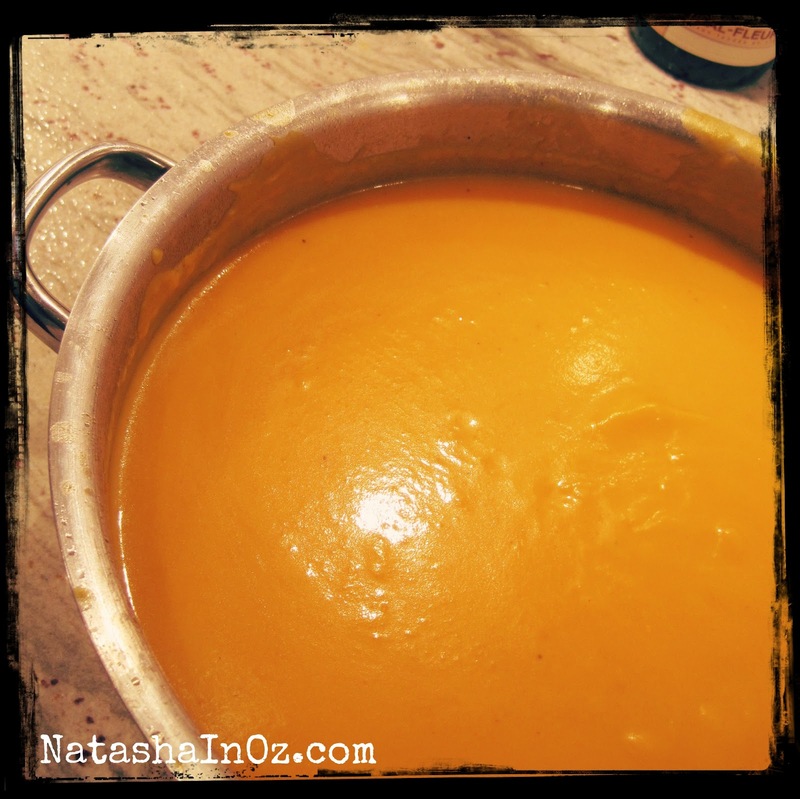 I usually make my pumpkin soup with a curry paste to add some spice to it. I love pumpkin soup and squash soup. Looks like a wonderful recipe! Your butternut squash soup looks great. I love soups and specially creams. This is my first time at your fun and great party. Thank you for hosting Natasha. HAPPY EARTHE DAY. Oh, hope your dear son a prompt recovery! Hi Natasha, your soup looks delish! Thanks for sharing and hosting another great party. Hope your little one is feeling better. Hope Al is feeling better. Your soup looks fantastic! I have developed lots of allergies to foods and this is something I can actually eat! Pinned this! Thank you for hosting and for joining me at Home Sweet Home! That soup looks really good!! I like making New England Clam Chowder but usually only do it for parties since it's so rich. Thank you so much for hosting. Sorry your little guy is not feeling well. 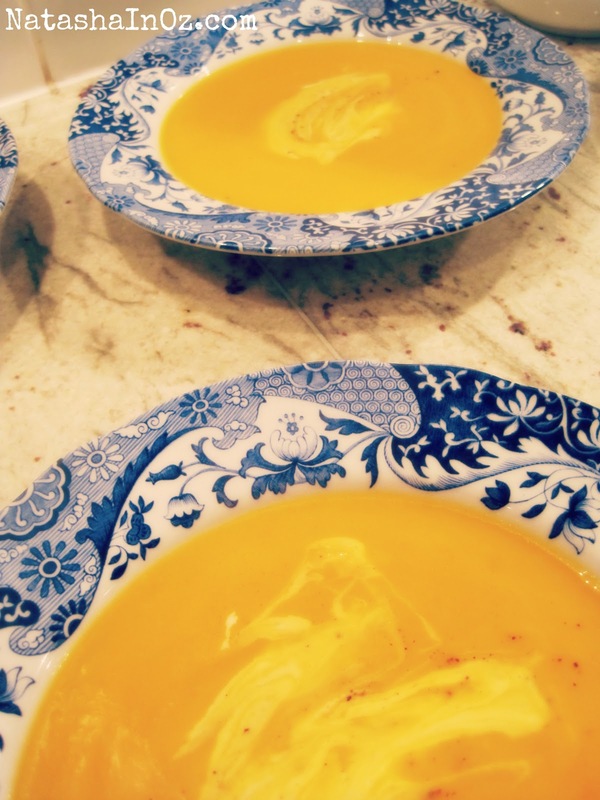 I just love the look of the pumpkin soup in the blue and white bowls! Hope the weekend brought you and your family rest and reccuperation. I can practically smell that soup...looks delish. Mmmm! Pumpkin soup looks so delicious! Hope your little one is feeling better now and thank you for the linky party! I love rich, creamy soups. Om nom nom. Thanks for sharing that great soup with us at The Sunday Round Up. Natasha, what a delicious-sounding recipe! I've always said I try making pumpkin soup, but still haven't... I MUST plan to do it in the Fall when our weather turns cool again. Thanks for boosting me in that direction! I've missed our visits but hope all is well with you and yours! This soup looks amazing!! I'm going to have to try it!! He is cute even when he's poorly, bless him. Dash still asks after Big Al too, so I hope he didn't stay poorly long. Roast Pumpkin Soup is the only kind of soup dash will eat. Autumn has certainly settled in...and pumpkin soup on these cooler nights are just what we need.Just perfect! Hi, I'm Jaime. I run a blog called The Dress-up Drawer and I was just passing through. Love your blog and the soup looks amazing! Your pumpkin soup sounds so delicious!!! 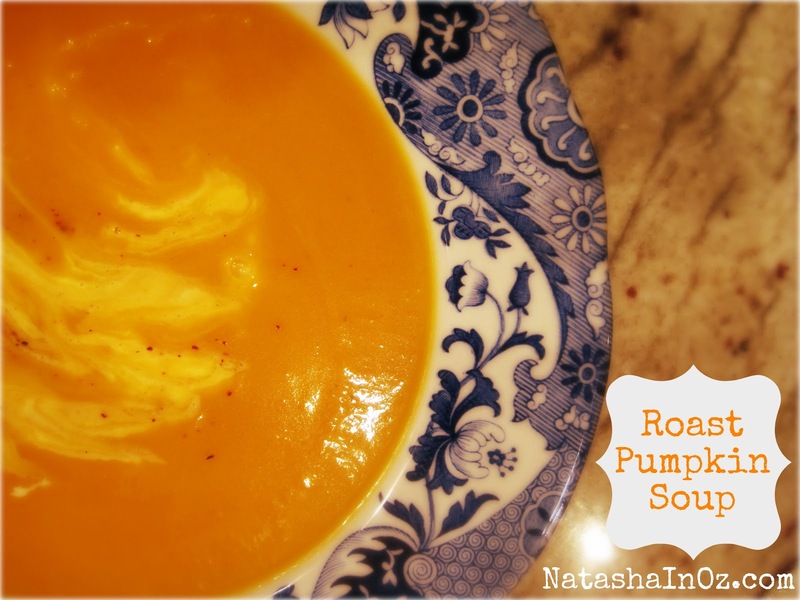 I adore pumpkin soup ~ any winter-squash soup, really. And this looks verrrry yummy!